George Harrison died of cancer at the age 58 last November in Los Angeles. 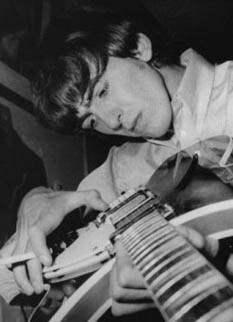 Best known for his work as lead guitarist for The Beatles, the "quiet Beatle", as many will remember him, is the brain behind such hits as "Here comes the sun," "While My Guitar Gently Weeps," "Something," "I Me Mine," and "Taxman." Earlier songs were "just any words I could think of," he once said in an interview. The more autobiographical one came much later, during his Post-Beatles solo career. But if one song, in his Fab Four area, is autobiographical, it's perhaps "Taxman" from the Revolver album. George Harrison composed "Taxman," with a little help from his friend John Lennon, in 1966, after The Beatles took a closer look at what they owed Her Majesty's tax collectors. "Taxman was [written] when I first realized that even though we had started earning money, we were actually giving most of it away in taxes. It was and still is typical," said Harrison in a 1980 interview. As our way of remembering Mr. Harrison, QL offers this anti-tax anthem, written when Britain had a 95% top tax rate – thus, the lyrics "one for you, nineteen for me". Let me tell you how it will be There's one for you, nineteen for me 'Cause I'm the taxman, yeah, I'm the taxman Should five per cent appear too small Be thankful I don't take it all 'Cause I'm the taxman, yeah I'm the taxman If you drive a car, I'll tax the street If you try to sit, I'll tax your seat If you get too cold, I'll tax the heat If you take a walk, I'll tax your feet Taxman 'Cause I'm the taxman, yeah I'm the taxman Don't ask me what I want it for (ha ha Mr. Wilson) If you don't want to pay some more (ha ha Mr. Heath) 'Cause I'm the taxman, yeah, I'm the taxman Now my advice for those who die Declare the pennies on your eyes 'Cause I'm the taxman, yeah, I'm the taxman And you're working for no one but me.